I have mixed feelings about being a woman in 2018. There were times that I felt pretty downtrodden, like no matter how hard women work, they always seem to draw the short straw. Even though there have been some tough moments this year, there were some pretty incredible ones as well. So, to celebrate, here is a list of some of the biggest wins for women in 2018, both Ivanti specific and outside of Ivanti. 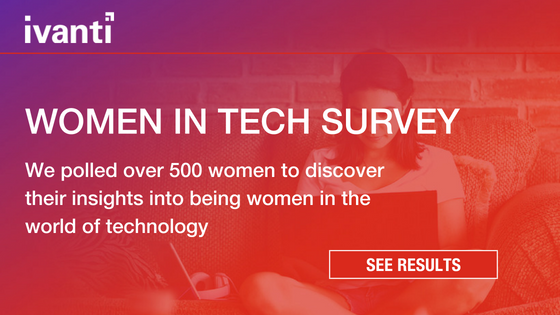 Earlier this year, Ivanti Director Sarah Lewis created our Women in Technology Campaign, which set to create a community, both online and face-to-face, for women working in all areas of the technology sector. The goal of this community was to create a place for women to encourage and support each other as well as collaborate. This campaign has been incredibly successful, including the release of a Women in Technology Survey, a Gender Inequality in ITSM Report, an active blog, and a quickly growing Twitter community that came be found @TheTechie Girls. In September, @TheTechieGirls launched the #MySuperPower campaign, which over 200 women across the world participated in. The goal of the campaign was to encourage women in technology to recognise their own strengths and to celebrate the strengths of others. We encouraged women to take a picture of themselves, holding a card with one of their strengths written on it and post it with the hashtag #MySuperPower. You can see some of these posts here. I heard story after story this year about women recognising unfair treatment in the workplace and taking a stand against it. Recently, Google staff across the world staged a walkout to protest the company’s treatment of women, specifically around sexual misconduct and harassment in the workplace. This walkout included both men and women who were fed up with the treatment of women at Google. In the recent US elections, a record number of women were voted into congress. There will be 100 women in the House of Representatives, which is still less than a quarter of the House of Representatives, but definitely a mark of progress. The Times Up Movement is meant to show solidarity to survivors to sexual harassment, abuse, and inequality in the workplace. According to the Time’s Up website, 1 in 3 women ages 18-34 have been sexually harassed at work and 71 percent of those women said they did not report it. This movement went viral at the beginning of the year and empowered women everywhere to stand up to sexual harassment in the workplace. The Me Too movement, although technically from the end of the year in 2017, has had a lasting impact in 2018. It went viral, demonstrating how widespread sexual assault and harassment is. It was started by Tarana Burke in 2006. At the end of 2017, Time Magazine named the “Silence Breakers” as their Person of the Year. This recognized the Me Too movement and the women who are mistreated. With the many wins for women in 2018, I can’t wait to see what’s in store for next year. Don’t forget to follow @TheTechieGIrls on Twitter, where we’ll post other wins we see.